Zanu-PF yesterday selected its candidates for the position of Speaker of the National Assembly, Senate President and their deputies in preparation for elections which will take place at Parliament Building today. The election of the presiding officers will pave way for the First Session of the Ninth Parliament to be officially opened by President Mnangagwa on September 25. 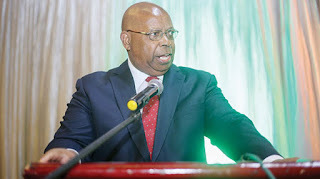 Sources said the Politburo unanimously agreed to retain Advocate Jacob Mudenda as the Speaker of the National Assembly, with Cde Tsitsi Gezi seconded to deputise him. The Politburo nominated Cde Marbel Chinomona as the Senate President and will replace Cde Edna Madzongwe. Cde Chinomona was the deputy Speaker of the Eighth Session of Parliament. She will be deputised by Retired General Mike Nyambuya. Cde Pepurai Togarepi, according to the sources, was nominated the Zanu-PF chief whip in the National Assembly. He will be deputised by Cde Obedingwa Mguni, while Cde Tsitsi Muzenda will be deputy chief whip in the Senate. This comes after President Mnangagwa proclaimed September 25 as the day for the official opening of the First Session of the Ninth Parliament of Zimbabwe. Clerk of Parliament Mr Kennedy Chokuda said the election of the presiding officers today would be preceded by the swearing-in of legislators who were not available on Wednesday last week. At least 341 of the 350 parliamentarians elected in the July 30 harmonised elections took their oath of office at Parliament Building last week. President Mnangagwa made the announcement for today’s elections in a notice published by Parliament.